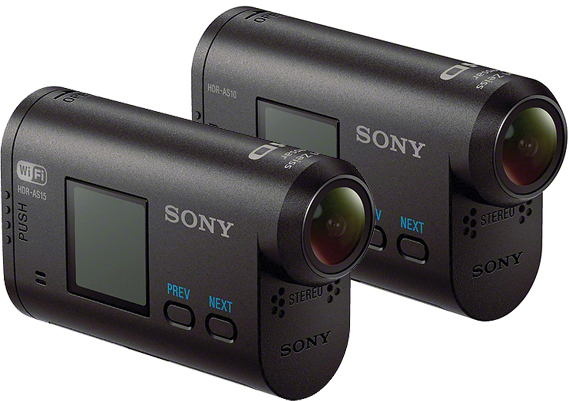 Sony has finally announced a pair of compact, rugged Full HD camcorders for point-of-view (POV) action sports videography. As this corner of the camcorder market continues to grow, we knew it would only be a matter of time until Sony offered a viable contender. The Sony HDR-AS10 and HDR-AS15 are basically the same camera with one exception: the HDR-AS15 provides Wi-Fi capability. This means that Wi-Fi enabled mobile phones and tablets that are equipped with Sony’s free PlayMemories Mobile app can pull optimized movies and photos from the HDR-AS15 without a cable. Once video is copied to your mobile device, you can use its 3G or 4G mobile broadband connection to email movies to friends and family or upload your footage to social media sites. Both the HDR-AS10 and the HDR-AS15 are designed for shooting in mountains, water or anywhere else you practice an extreme sport. They’re ideal for skiing, snowboarding, skateboarding, surfing, motocross, skydiving, mountain biking—even bungee jumping. These lightweight and rugged wearable action camcorders weigh only 3.2 ounces (90 g) and they record at resolutions up to Full HD 1920 x 1080p at 30 frames per second (fps). They also support other shooting modes including a 2x and 4x Slow Motion Video Mode. The 2x Slow Motion Mode supports 1280 x 720p HD resolution video capture at 60 fps. The 4x Slow Motion Mode supports 1280 x 720p HD resolution video capture at an amazing 120 fps. Having 120 frames per second to break down video frame by frame makes the 4x Slow Motion Mode a valuable tool for both movie making and review of your tricks, line, form and technique. Sony includes a rugged waterproof housing with each camera. The housing has a universal tripod mount and is waterproof to a depth of 197 feet (60 m). It is also dirt and dust resistant, which makes the camera nearly impervious to mud, snow, rain, sand and grime. Both cameras also feature two adhesive mounts that attach securely to most flat and curved surfaces. With the waterproof housing, included mounts, different shooting modes and soon-to-be-available optional mounts, these action camcorders will excel when shooting extremem sports in virtually any environment. The HDR-AS10 and HDR-AS15 are both equipped with a Carl Zeiss Vario-Tessar lens with an ultra-wide 170° viewing angle. They also have back-illuminated Exmor R CMOS image sensors, which offer superb low-light performance and support Full HD video. To compensate for camera shake that’s typical when shooting POV action for extreme sports, Sony outfitted both models with SteadyShot Image Stabilization with Active Mode, which uses an innovative 3-way shake-canceling function to reduce blur caused by camera shake. Other convenient features shared by the HDR-AS10 and HDR-AS15 include Press-n-Go recording, HDMI connectivity and a built-in stereo microphone for capturing high-quality audio to go along with the Full HD video. The Press-n-Go recording function allows you to press a large Start/Stop button just once to begin recording, and the HDMI output lets you display your footage on a large HDTV screen in 1080p Full HD resolution. The two cameras are also outfitted with a Memory Stick Micro and microSD/SDHC memory card slot for recording directly onto a memory card, which you can remove and insert into your computer for editing and sharing movies on the Internet. No other action camcorder available combines Carl Zeiss optics with a rugged exterior that welcomes mud, snow and water. So if you’re as serious about capturing quality video as you enjoy your sport of choice, then the HDR-AS15 and HDR-AS10 should definitely be considered. Plus, the included waterproof housing and optional mounting possibilities make these two Sony action camcorders flexible and rugged enough for any action sport under any conditions. Consider using the skeleton case so there is protection and ventilation that will dissipate the condensation. with the Sony Action Cam HDR AS15 can you broadcast live on ustream etc.... ? if so how do you accomplish this? This action cam does not offer live-streaming features. The compact Sony HDR-AS100V POV Action Cam is designed for point-of-view (POV) shooting during action sports including skiing, snowboarding, skateboarding, surfing, motocross, skydiving, mountain biking and other outdoor adventure sports. Compared to its predecessor, the HDR-AS30, the HDR-AS100V features a body that is splash resistant even when not in the underwater housing. It supports up to Full HD 1080/60p XAVC S video at 50 Mbps. It also supports other shooting modes including multiple slow motion modes. You can shoot 1280 x 720p slow motion video at 100 or 120 fps, and 800 x 480 slow motion video at 200 or 240 fps. The camera can also capture 13.5MP still images when using the photo mode. When tethered to a device that has an Internet connection, stream live to the U-Stream website . I wonder what the ever-so-troublesome audio is like. Every video camera I've used has very bad wind friction noises recorded through the microphone. I have the sony hdr-as15 and i put it in a camcorder accessory then took it out of the camcorder and now its stuck in media mode so it wont let me take videos or pictures. What do i do? You will need to download the Play Memories Mobile App from the Google Play store. This versatile Compact AC/DC Charger from Watson charges any NP-BX1 lithium-ion battery via the included dedicated battery plate. The charger runs on 100-240VAC power, allowing for worldwide use. It features a fold-out 2-prong US plug and is supplied with a European plug adapter, as well as a 12VDC car charger that plugs into a cigarette lighter. This makes it ideal for use both at home and on the road. The Compact AC/DC Charger features a USB power output that allows you to charge & power MP3 players, phones, digital cameras, and other devices with a USB power input - even while charging your camera or camcorder batteries. With its easily interchangeable plate, the charger can also be used for other battery models - via the purchase of an additional battery adapter plate. Is there are possibility to use that camera without battery attached (when device is connected/plugged in to usb socket only - i.e. in a car or on a motocycle)? Can't find any specs on recording time.. found a note on a rewiew sie saying 163 min recoring wifi off but how much can I cram into a sd card? What recording time do I get on a 32 gb memorycard? There seems to be conflicting answers about this product. Now that the cam has been out there for awhile, can someone answer the following? 1) If I run the cam with/without (wifi turned OFF) image stabilization...how long is battery life? 2) Can the cam be powered (not charged) from an exterior power source (external battery)? 3) Will running the cam for 3 hours overheat it and therefore causing it to shut down? 4) Can someone recommend a better dash cam (than the Sony Action Cam)that has wide angle (120*)? 5) Can I use another battery other than the Sony Action Cam battery such as the Sony "G" series batteries? Thanks. I love this camera! it is great for being stuck on the side of my helmet riding in all types of weather and it shows a high definition of when you speed up and slow down, especially in cornering etc. I can finally watch myself riding my sports bike from a real different angle! Friends all agree that this is the camera to get for action. It's been mounted under a long board and captured great footage. Next will be an underwater project. This is a great ruggered camera. Im not worried about the interior specs. It does the job and people who watch my recordings are amazed at the quality!! Thanks for another awesome sony product! as far as I read about the sony cam there is probably much more possible within changing the firmware. i am thinking about changing the lense width, allowing graphics on the addon-lcd screen, maybe changing from ntsc to pal and so on. oh and does there exist a sony as15-only forum (like one of these many of the gopro)? This camera is a Joke. There is a long list of fails from the remote, menu, power features, attachments and finally the plan obsolescence of the frames rates this camera belongs in 1992. Sony claims to shoot at 60 frames per second and 120 fps. They are deliberately trying to fool people that don't know better. This camera only shoots HD at 30 fps. The 60 and 120 modes don't include AUDIO and only can be viewed in slow motion. So really the only thing it does is slow your video down x2 and x4 in case you want to watch paint dry...So stupid! Oh plus you can't up load the video directly to Facebook. Another epic fail! It doesn't seem that bad compared to the GoPro 3 series. This camera is not a joke. It's a quality product designed to take the footage during the extreme conditions. No camera records the sound while rolling at 120 fps. If you really want the sound use the separate audio recorder. That's how it's done in professional world. If you want to see the footage in a "normal" speed, then do a little work and edit it in After Effect or FInal Cut Pro. After all you are getting is a raw material which requires some additional work. You don't complain when you go to the market to buy the veggies but still have to chop them later on and add some salt and paper! But what am I saying. All you want to do is to let everyone you "know" on a Facebook to see what a splendid joy ride you had from the local mall to your apartment. You don't need this camera anyways. I am a professional animator/developer/bike enthusiast and I recommend this camera. Just got this cam as a gift and trying to charge the new battery. I followed the instructions to select USB power ON but the CHG indicator does not light up. What am I missing here? thank you dana g. that tip was very helpful and now i know how to charge my camera. many thanks for your input. I am thinking of buying the Sony rather than the Gopro Hero 3 Black. I have read mixed reports on both. Would you recommend the Sony over the Gopro? Both are great units for action cam video. The GoPro Black is a step up though in that it does offer the ability to record in 4K, 2.7K, 1440p & 1080p where the Sony is limited to 1080 as it's max resolution. If you feel you will need any of the additional resolutions for your production the GoPro Black would be a camera to consider. If you are just recording in 1080 though both the Sony action cam and the GoPro Black/Silver will work great for you. Hi, this is a great camera (I have one) and the night capture is far better than the gopro. In sony hdr-as15 is only one thing I don't like, this have not AV out composite, only hdmi and the expantion connector, and it would be good to have cause I do FPV. The file size is no bigger than any other HD video file. Actually after checking their exactly the same per frame rate as my much better, Sony HDR-cx500 and Canon HF S100 camcorders in the same resolution. And yes they are large but I have hundreds of hours of music video's with mutable camer shots on a 2TB Drive with lots of room to spare. Make me mistake, the GoPro is a great cam. So is Sony's HDR-AS10 & AS15 and of this writing AS30. Just depends on what you want it for. I found the Sony to be better, at IS, white balance, color, and sharpness. The GoPro has better mount options, more accessories. I got my AS15 for a 4th cam B-roll additional shots to my 2 Sony HDR-CX500's and Canon HF S100 HD Camcorders. I record my sound production shows and wanted to do some specialty shots with as15 like clipped to the guitar, drum rack, wide stage, across stage, light tower shots, stuff like that. I have tested it in the car and as dash cam worked great. I agree with BZ...who actually uses audio from a slowmo shoot? And the speed of the video should not be a problem for anyone who can use any type of NLE - all have simple functions for changing the velocity of a video. I use the camera mainly on mine sites in Australia and it can take a lot of very demanding conditions and with the purchase of a few inexpensive extra mounts can be adapted to a variety of circumstances. It is not a toy ...unless you want it to be. The whole point of shooting at 120fps is so it can be viewed in slow motion. What an epic fail. Loool, coments like this are great to laugh. First - the sound record in slowmotion (60fps) or super slowmotion (120fps) --> no offence but stupid are you. This way, Sony should program this camera to share to all web servers, just lol. Keep using NTSC and Sony`s superstar will keep cheap! My question is if I can charge the camera Sony HDR-AS15 with a blackberry charger, or a charger samsung s2, since they have the same USB cable?. You can use a wall charger for the camera as long as it is a Micro-USB into the camera itself. So jus got one of these. Pretty cool. Straight into water. Great camera and had querys about how it would handle sunset-dusk! Perfect! One question though the little sd card it came with we have almost used the memory up. So... Is there a way we can delete/clear th videos stored on it from the camera itself? When using the Play Memories Mobile app I cannot transfer 1080P video from my AS15 to my smartphone. Play Memories Mobile appears to only work with 720P video. Is this a limitation of Play Memories Mobile? This is most likely a limitation of the app and your phone since the camera captures video at 1080/60p MPEG-4 AVC/H.264 (MP4). Can someone please confirm that i can charge while i'm recording, as in using let's say a usb power pack to get more hours out of the unit! Continuous movie shooting time is approximately 13 hours. Oh, okok thank you for your reply. But the times you gave me, 13, 6.5 and 3 hours. are those really based on the battery or the memory card? I sadly doubt that the 1000 MaH battery can last 13 hours, but if what you say is true, you're a hero and i'm lucky. Going to be using these to record my live performances, they outrun gopro in low light performance! but i need to make sure i can record 2-3 hours on each camera, otherwise it will have to be a gopro black with batterypack on it! On page 25 of the pdf manual, it does state that the camera can be supplied with power from an outside source thru its mini-USB connector. This sorta suggests that if you were to use a battery device like the New Trent iMirror 6000mAh 2A charger as an exterior battery pack, the camera would work okay. I never expect this kind of an answer from B&H. The battery life is 13Hrs??? are you Joking? See page #18 regarding Recording mode. Please don't compare battery life and memory capacity. I appriciate anyone can post their practical experience regarding battery life when camera under recording on 1920 x 1080 30p. Some comments at other sites have mentioned that it is difficult or impossible to use the microphone plug while the underwater housing is being used. Yet without the housing the unit has no tripod mount. Is there a way around these problems? If being used for non-wet or dirty applications can the camera be put in the housing with the front down and with the microphone cord connected? Does it allow to charge battery and record at the same time? It does allow charging while recording. From page 14 of the handbook: "Charging is not possible when the camera is turned on." We're using two of these for specialized aerial work and are very pleased with the results, ease of use, and overall performance. We also have the GPs. Framing through WiFi is realtime. Our issue is hardwiring Vid out. Looking for a very light Mini HDMI-to-Composie converter. Tiny, or the circuit schematic. One thing that i would like to ask, is about the underwater video quality. as go pro had issues with the curved lens, so does the sony. all underwater video on youtube is blurry...(not because of compression, but because of the curved lens). i read elsewhere that sony will sell 'replacement' doors for the underwater housing(3 other types actually) , with one of them being with FLAT lens for clear underwater videos. any info on this and how much it will cost. Do we keep the stereo sound (and same sound level and quality) when the camera is in the waterproof case? If not, any possibility to connect an external mic with the case?